Although the first snow storm last week didn't bring us as much as we expected, the second storm this week combined with with a few smaller storms has definitely started to make the snow add up. And although some grown ups may feel differently (this time I was actually excited to get some snow, but who knows how I'll feel in a few weeks) most kiddos usually get pretty excited about the snow coming down. The other thing that my boys get excited about is watching the plow trucks. We live on a small, dead end road but our town road crew, or highway department as they're called in larger areas, plows a large chunk of our roadway. For our boys, that's part of the highlight of a snow storm: they get to watch the plow trucks at work. 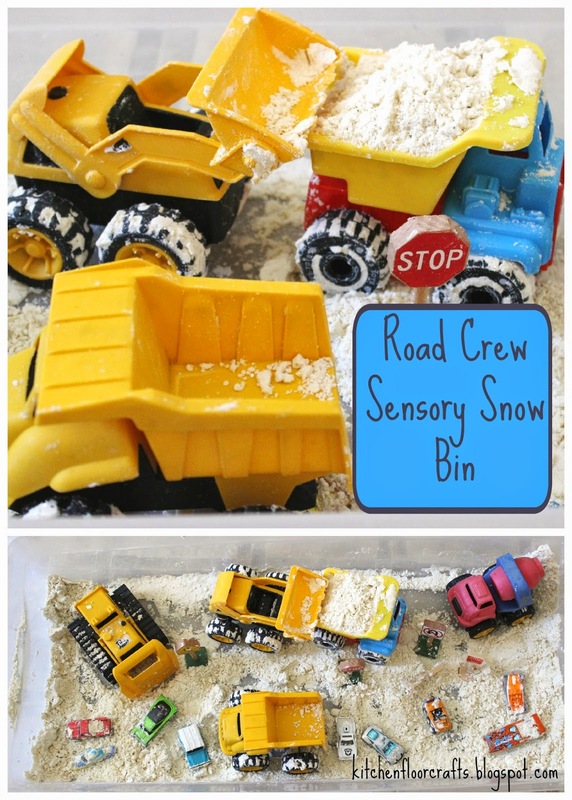 This lead me to be inspired to create our newest sensory play activity: Road Crew Sensory Snow Bin. Across the east coast cities and towns have people busy at work plowing, loading, and removing snow. 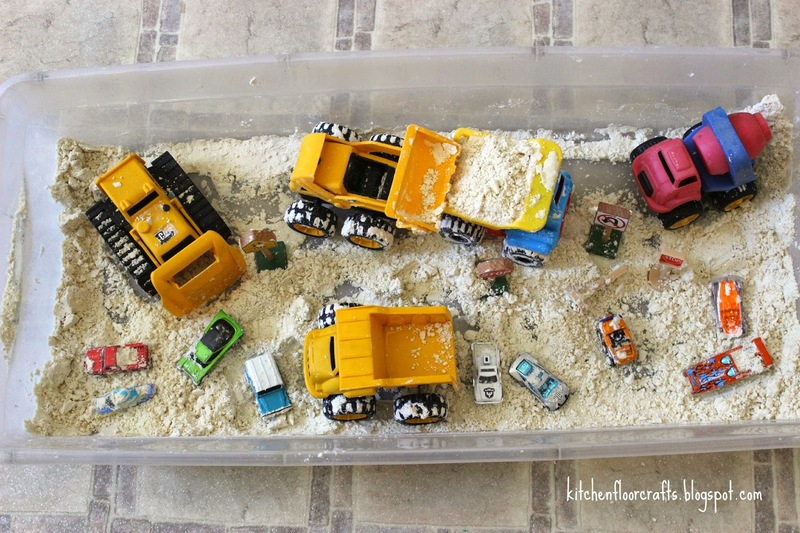 What kiddo wouldn't enjoy recreating the same experience? 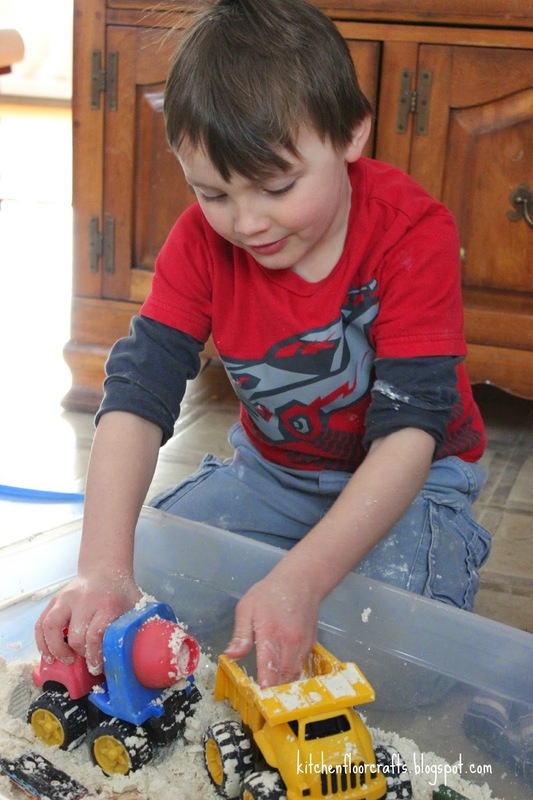 Similar to our Sparkle Snow Dough, we started with a basic "Cloud Dough" recipe. 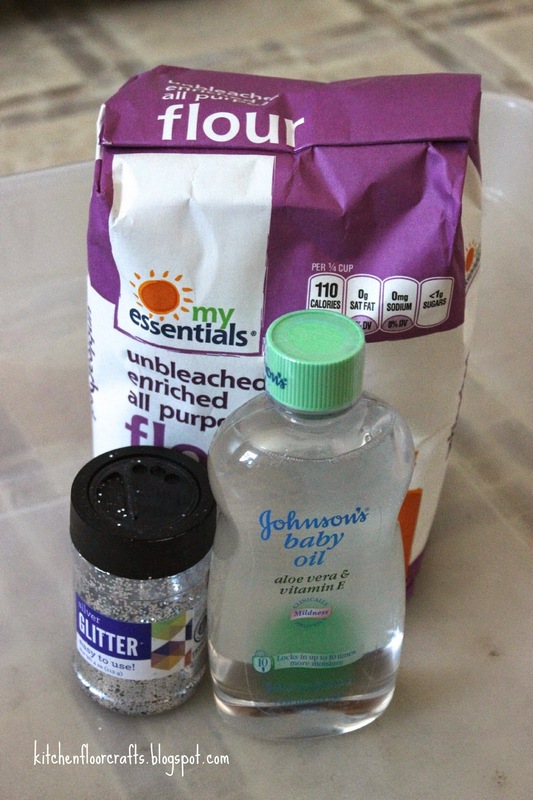 Directions: Combine the ingredients in a large bin or plastic tub and mix well with hands. As the ingredients mix they will stick together, but become a soft, fluffy texture. 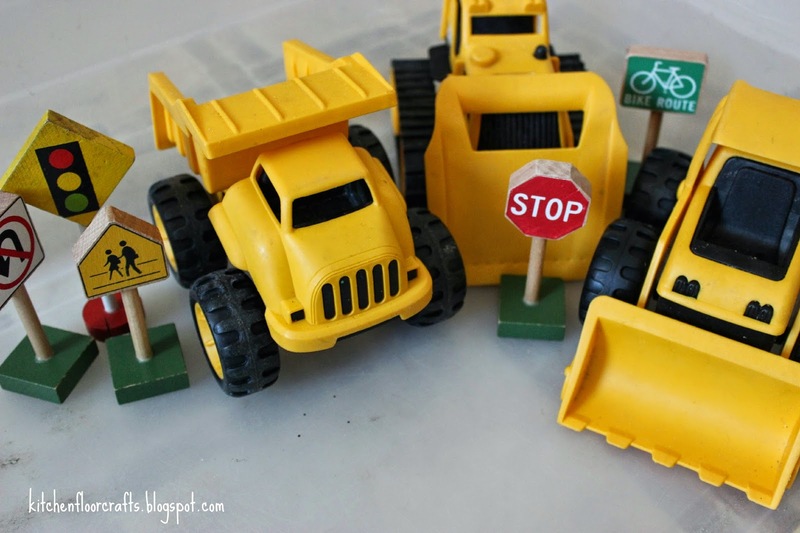 For the "road crew" component of this bin we added in several plastic construction vehicles we own, road signs from our train set, and later toy cars. 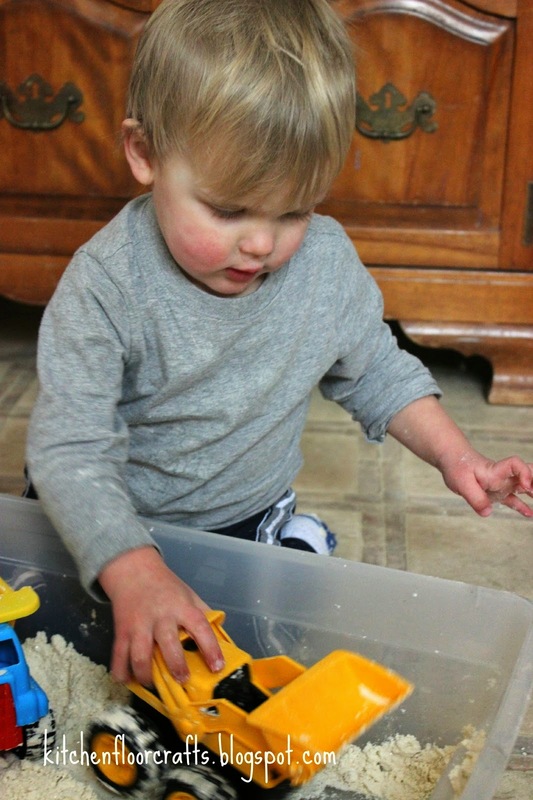 I set the bin up on the kitchen floor because this type of sensory play can get very messy. Both boys joined in at the same time. They loved working to load the trucks especially. 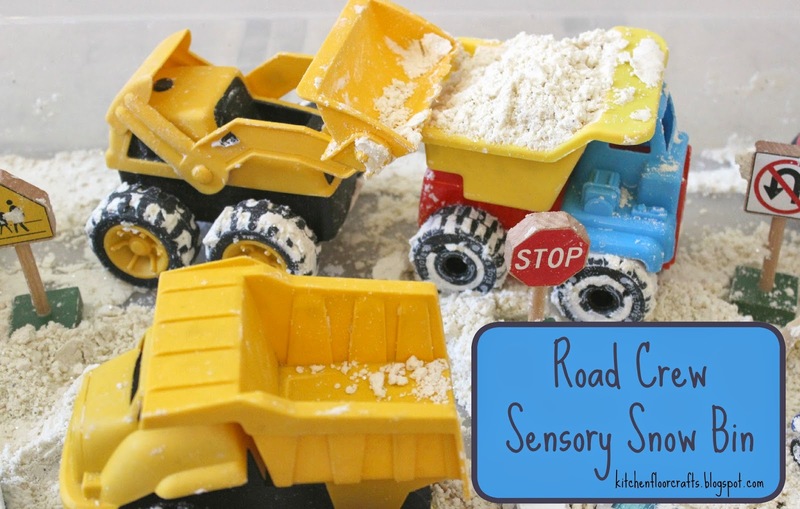 Big Brother, as often happens now with our sensory play, added a story line to what was happening. Little Brother enjoyed using the backhoe to load a dump truck, and then dump it out. They've returned to the bin several times this week, adding in the race cars eventually so that the trucks had someone to clear the roads for. Of course, then the cars became like several real motorists, who got stuck and buried in our snow, and needed digging out. 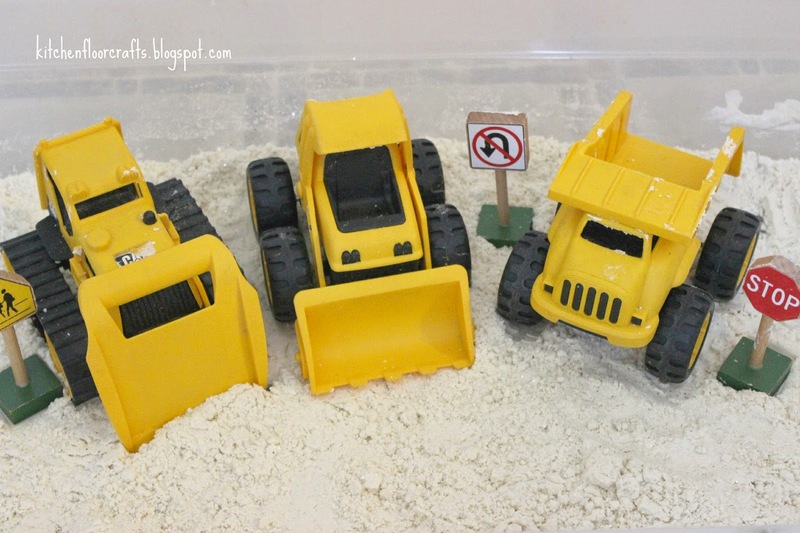 A really fun way for the boys to think about something they're seeing in real life and simulate it in their own play. How much snow are you wading through this week? 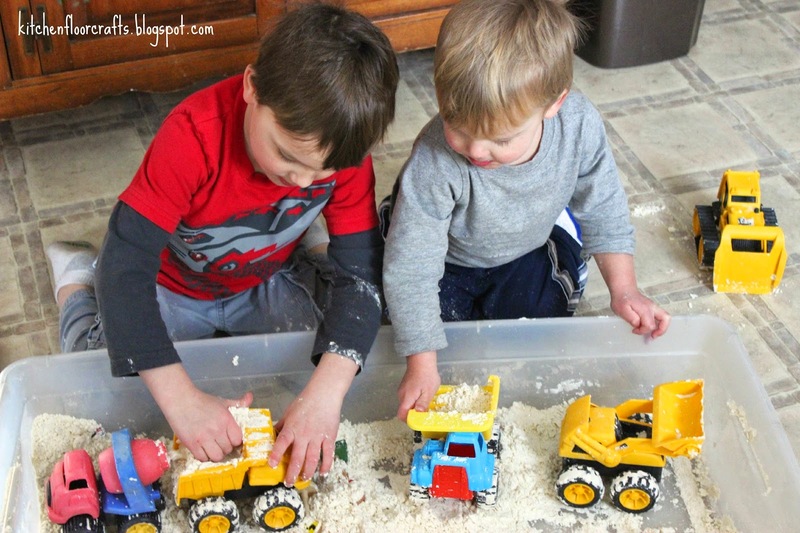 Or, do you wish you had snow and need to create some inside to have some winter fun? Let us know below!